In 1880, Anglican bishop Edward White Benson conceived a festal service celebrating Christmas with nine lessons and songs. The observance has continued in many forms, most famously in the annual Christmas Eve liturgy held at King’s College, Cambridge, England. 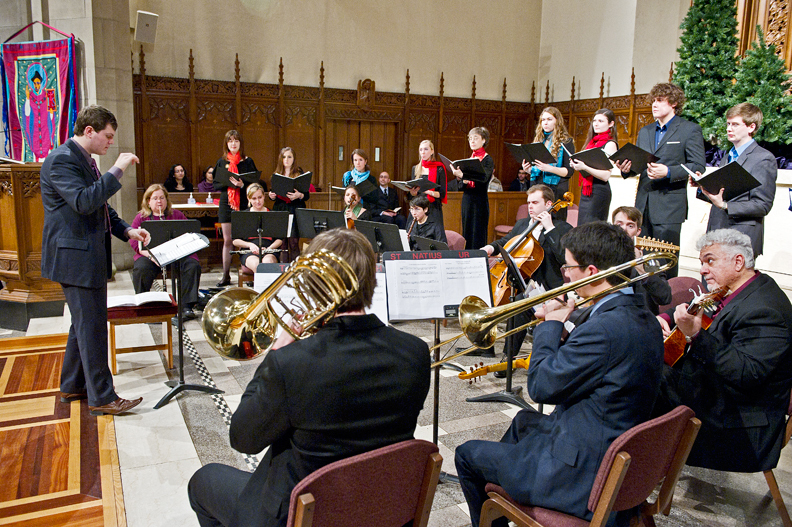 On December 11, 2010, 13 singers, 12 musicians, and nine readers from Boston College and the St. Ignatius of Loyola parish presented Gaudete in Carminibus (“Rejoice in Songs”), a version of the festival conducted in five Romance languages—French, Italian, Spanish, Latin, Portuguese—and English. Held in St. Ignatius Church, the ceremony opened with the medieval chant “Letabundus,” performed as part of a candlelit procession. Other songs included “Entre le boeuf et l’âne gris,” “Riu riu chiu,” Palestrina’s “O Magnum Mysterium,” and Domenico Zipoli’s “Laudate Dominum” from the Vespri di San Ignacio. The event concluded with the audience joining the chorus for a rendition of “Silent Night,” with each verse sung in a different language, finishing with English (making its only appearance). The readings began with lessons from Genesis, read in Latin, and ended with the Gospel of John, in Italian. Daniel Gostin ’09 (above) conducted the music and co-directed the service with Ana Conboy (left center with blue scarf), a Romance languages and literatures Ph.D. student who sang soprano in the choir. The event was sponsored by the University’s department of Romance languages and literatures, Office of Residential Life, Maison Française, and Casa Hispánica, in cooperation with the St. Ignatius music ministry. This feature was posted on Wednesday, December 22, 2010 and is filed under Featured Photo.